You have to love his looks. He's friendly, he's silly, but there's something about that loveable look that we really like. He holds a lantern which provides convenient night light or accent light. 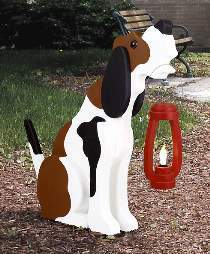 A great stand alone decoration or place him next to our W2477 Picket Carolers during the holidays. Easy to make from standard lumber sizes. Easy to assemble. Easy painting pattern. Stands 23-1/2"H. Patterns drawn FULL SIZE. Order hardware below.